The following statement was released (English translation below followed by Spanish original) by the Plenario Intersindical de Trabajadores-Confederación Nacional de Trabajadores (PIT-CNT), the sole national confederation of trade unions in Uruguay, in support of Palestinian prisoners on hunger strike. This important statement reflects the growing support and international workers’ solidarity with hunger-striking Palestinian political prisoners and the Palestinian cause. 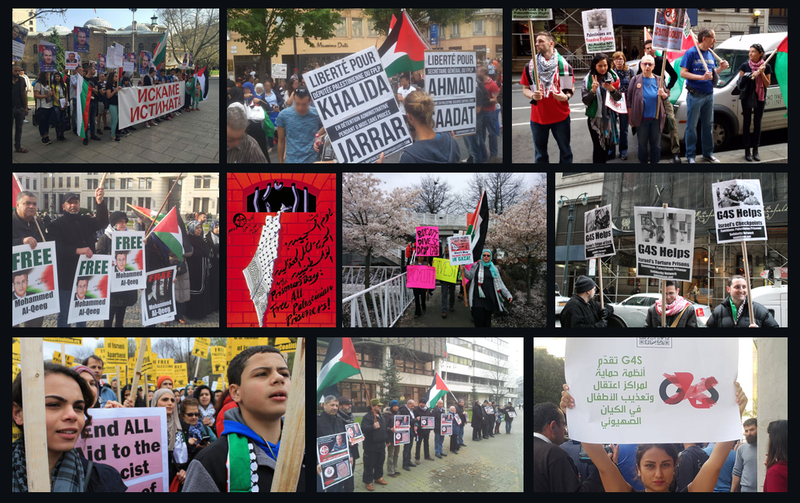 Samidoun Palestinian Prisoner Solidarity Network salutes the PIT-CNT for this important stand at a critical moment for Palestinian prisoners nearing their 40th day on open hunger strike for dignity and freedom. The PIT-CNT joins the Canadian Labour Congress, 26 European trade unions and labor organizations, the World Federation of Trade Unions, the International Trade Union Confederation, Congress of South African Trade Unions (COSATU) in standing with the hunger strikers as well as the Norwegian Confederation of Trade Unions (LO), and numerous labor unions around the world who have embraced the campaign for boycott, divestment and sanctions. Palestinian prisoners are on the front lines of the international struggle to defend human dignity against oppression, racism, capitalism and imperialism, and the support of workers’ movements around the world reflects their central role – and that of the Palestinian people – in the global struggle for justice and liberation. As Uruguay’s organized working class that has always held high the principles of proletarian internationalism and solidarity among peoples, today we want to express our solidarity with Palestinian political prisoners in Israeli prisons. On April 17, International Day of Solidarity with Palestinian Prisoners, more than 1,500 prisoners began a hunger strike for an indefinite period. The strike, which is backed by all Palestinian political parties, has been joined by prominent leaders of the prisoners’ movement and the Palestinian national movement. International solidarity also surrounds the strikers: expressions of support for the hunger strike are growing in streets and squares all over the world, from British students to Christian bishops. The prisoners demand respect for their fundamental human rights. Their demands include the end of prohibition or restrictions on family visits, the right to adequate medical care, release of the sick or handicapped prisoners, the right to education in prison, and the end of the policies of isolation and “administrative detention” (without charge or trial). There are currently 6,500 Palestinian political prisoners in Israeli jails, including 300 minors and 500 people under “administrative detention”. All have been tried and convicted by military courts of the occupation army, including children. Trade unions, federations and confederations of trade unions around the world have spoken out and mobilized in support of the prisoners on hunger strike. Our working class also wants to join these expressions of solidarity. As trade unionists who in the past experienced repression, torture and prolonged imprisonment at the hands of an authoritarian regime, we are concerned at and called upon by all Palestinian political prisoners, and in particular by the situation of minors in Israeli military courts and prisons. We demand that their human rights be respected according to the International Convention on the Rights of the Child. We are particularly concerned at the serious health deterioration experienced by the prisoners on hunger strike, aggravated by the harassment they are being subjected to by the regime: isolation, raids and searches, painful and constant transfers, suspension of family and legal visits, and the threat of forced feeding, considered torture under international law. We demand from the State of Israel: to respect International Human Rights Law and International Humanitarian Law; to put an end to the practices and policies of punishment and persecution of the prisoners, especially isolation and arbitrary and prolonged detention. We make Israel accountable for the lives and the bodily integrity of the prisoners on hunger strike, and we reiterate our solidarity with those who have no other weapon than their empty stomachs to demand justice, freedom and dignity. Nos preocupa especialmente el grave deterioro de salud que ya experimentan los prisioneros en huelga de hambre, agravado por el hostigamiento al que están siendo sometidos por el régimen: aislamiento y traslados penosos y constantes, suspensión de las visitas de familiares y abogados, y la amenaza de alimentación forzada, considerada tortura en el Derecho Internacional. Exigimos al Estado de Israel que respete el Derecho Internacional de los Derechos Humanos y el Derecho Internacional Humanitario; que ponga fin a las prácticas y políticas de castigo y persecución de los prisioneros, en especial el aislamiento y la detención arbitraria y prolongada. Responsabilizamos a Israel de la vida y la integridad de los prisioneros en huelga de hambre, y nos solidarizamos con quienes hoy no tienen más arma que sus estómagos vacíos para exigir justicia, libertad y dignidad.